Need to make a quick note, reminder or list? 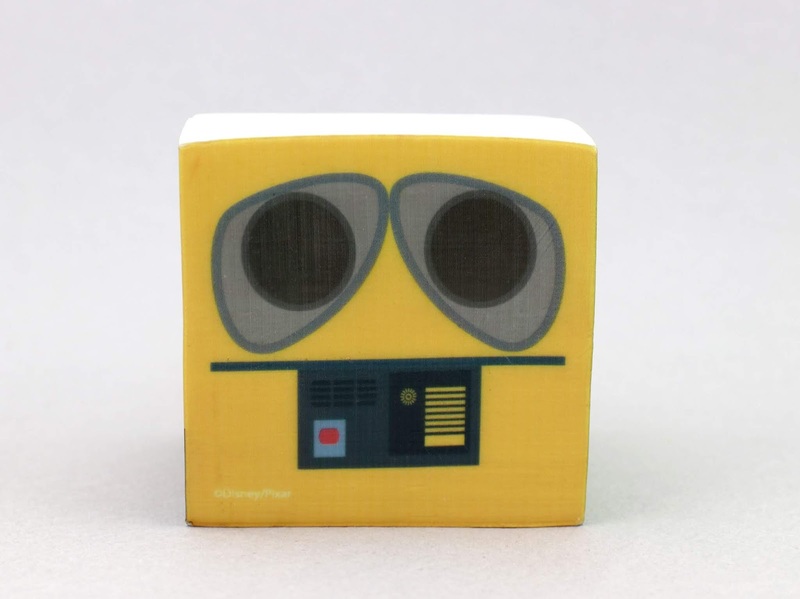 This cute Pixar "memo cube" (made up of sticky notes) is perfect for any home or work office desk! 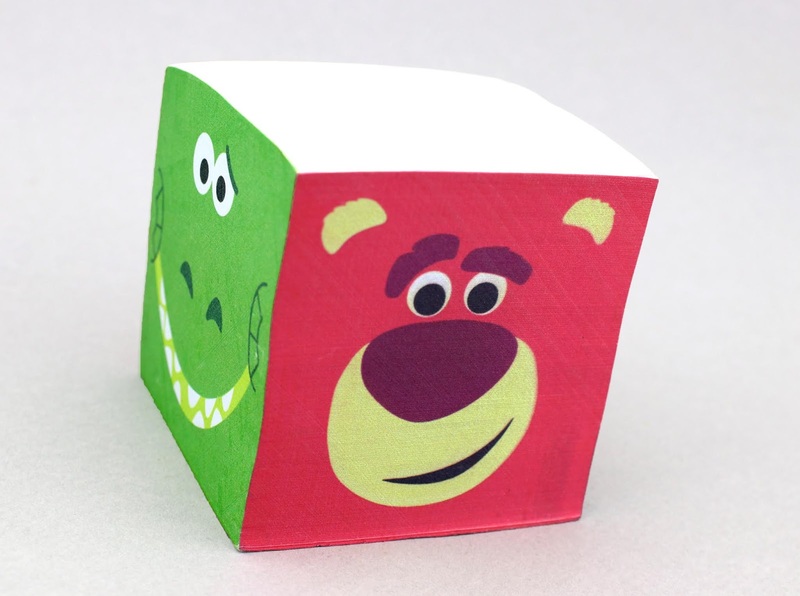 There are 700 paper sheets total that make up a 2 3/4'' sized cube—each side with a favorite Pixar character (featuring the same cute square designs we've seen on products since 2015). 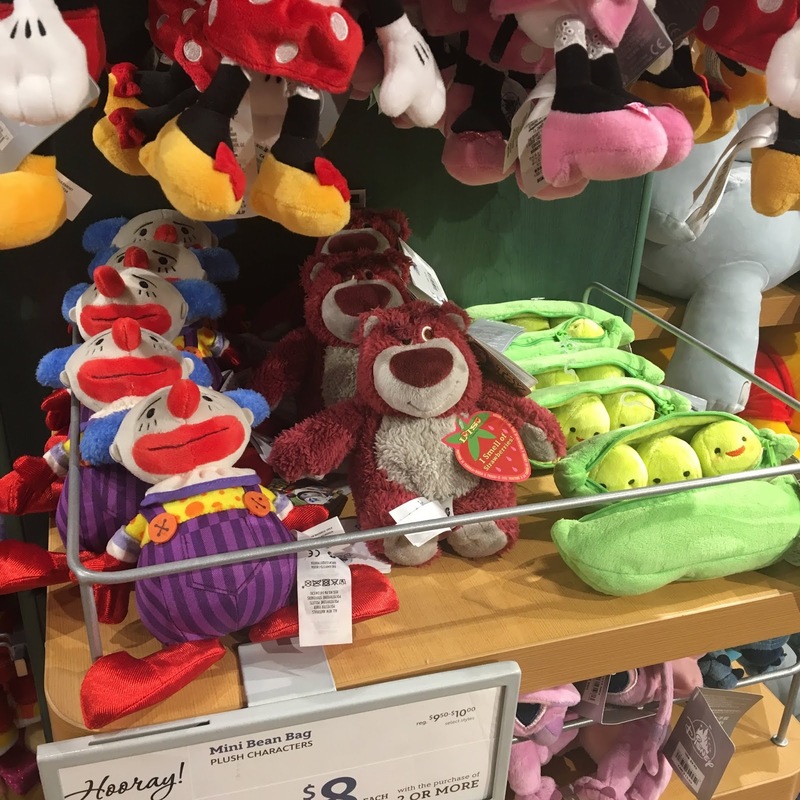 There's Dug, Lotso, Rex and Wall·E! 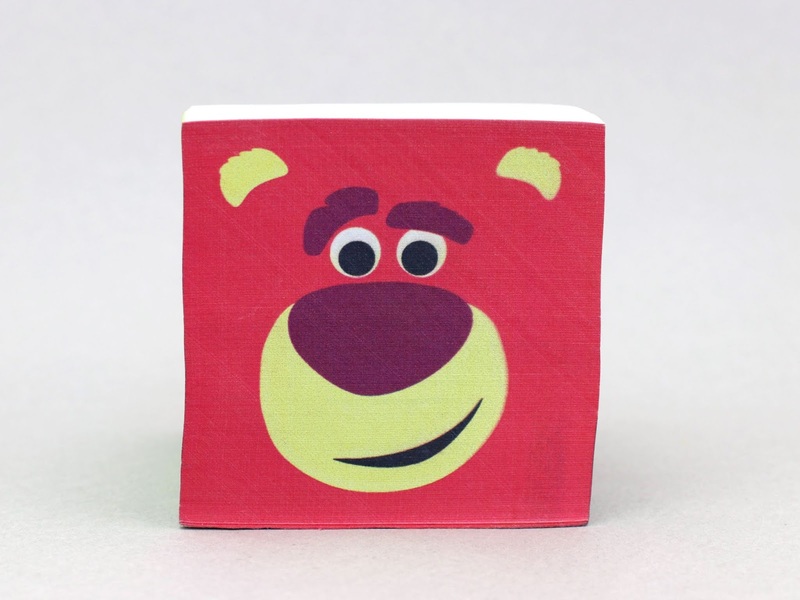 I'm excited to put this on my desk at work on Monday so I can finally bring a little Pixar love/magic to my standard work day. 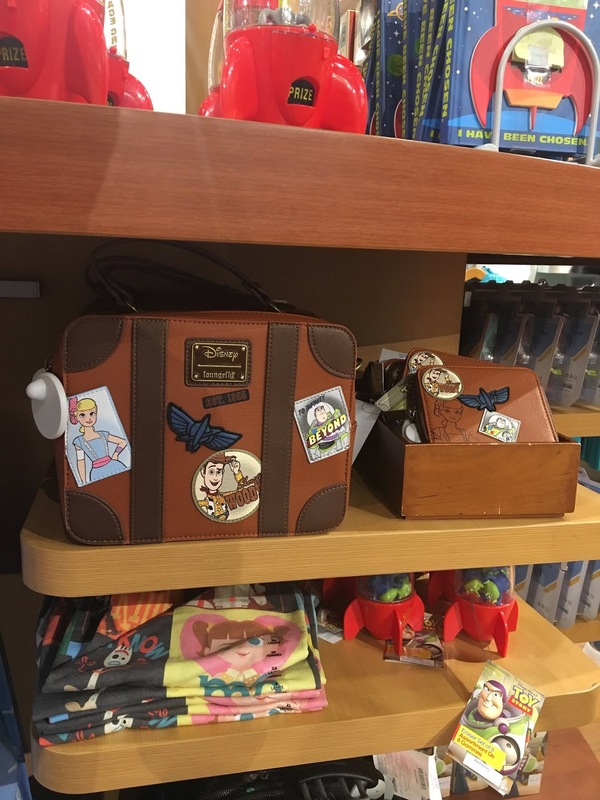 This was available at BoxLunch Gifts last summer and then at the Disney Store/ShopDisney.com throughout the fall. It eventually went on a pretty steep clearance sale, so naturally it has since sold out. 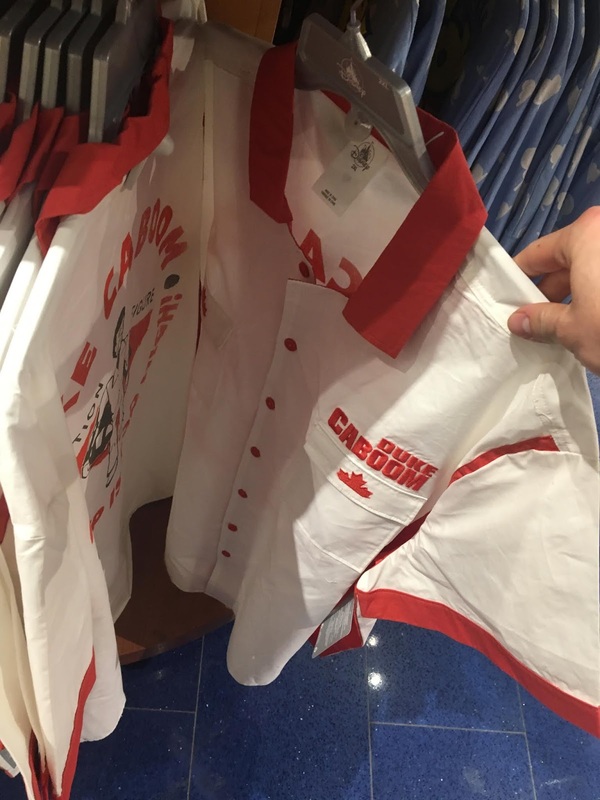 Original retail was $6.95. Thanks to my in-laws who gave this to me in my stocking this past Christmas! It was the perfect stuffer. If you're interested in grabbing this for your collection, there are still a couple options. 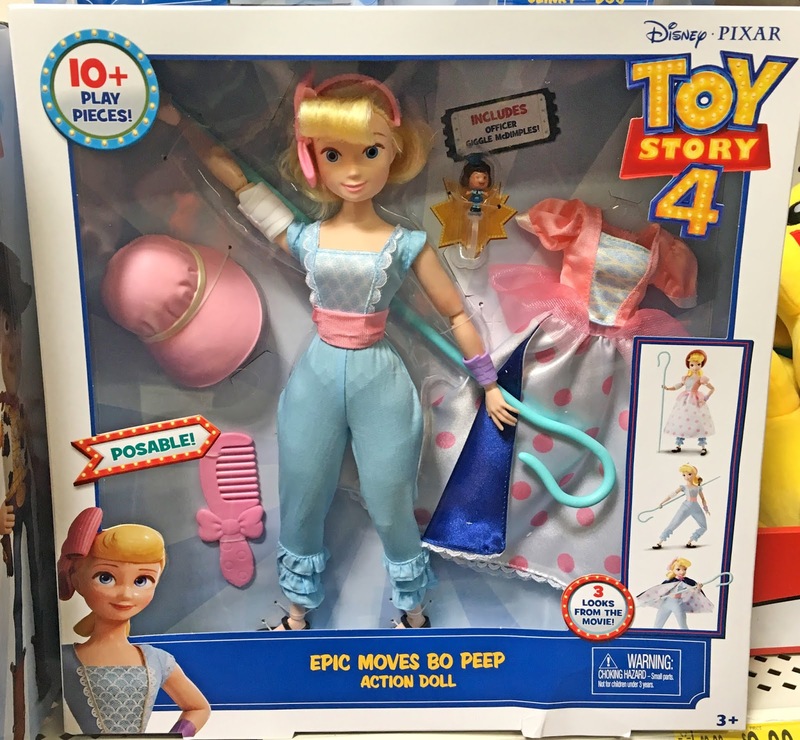 At this point you can find this on eBay using this direct link or on a website I came across called disneykidhouse.com. Definitely pick it up if you missed it originally. 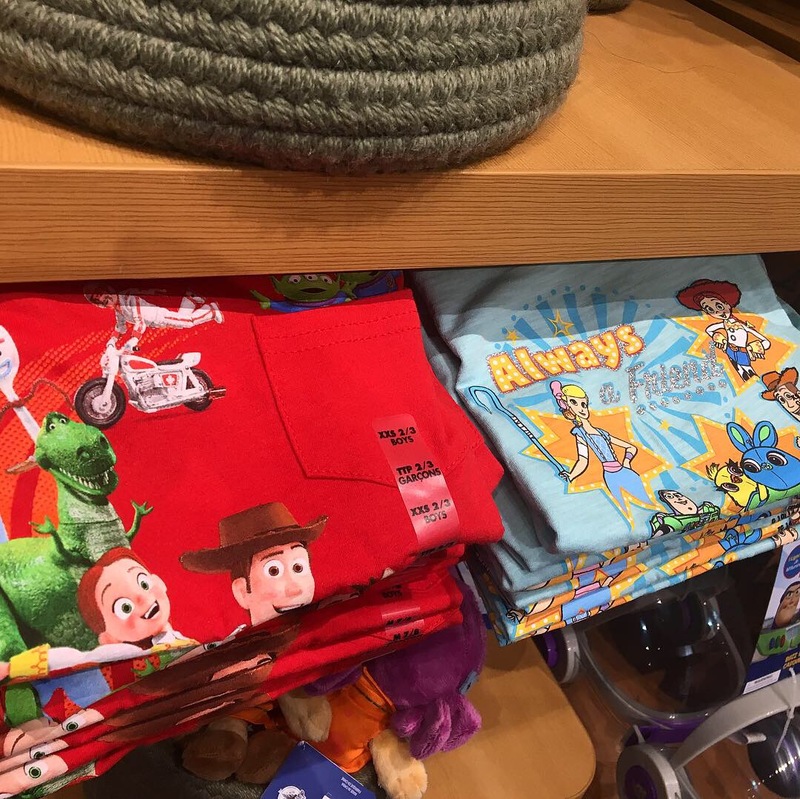 Let me know your thoughts down below and be sure to check back daily for more from my Pixar collection! 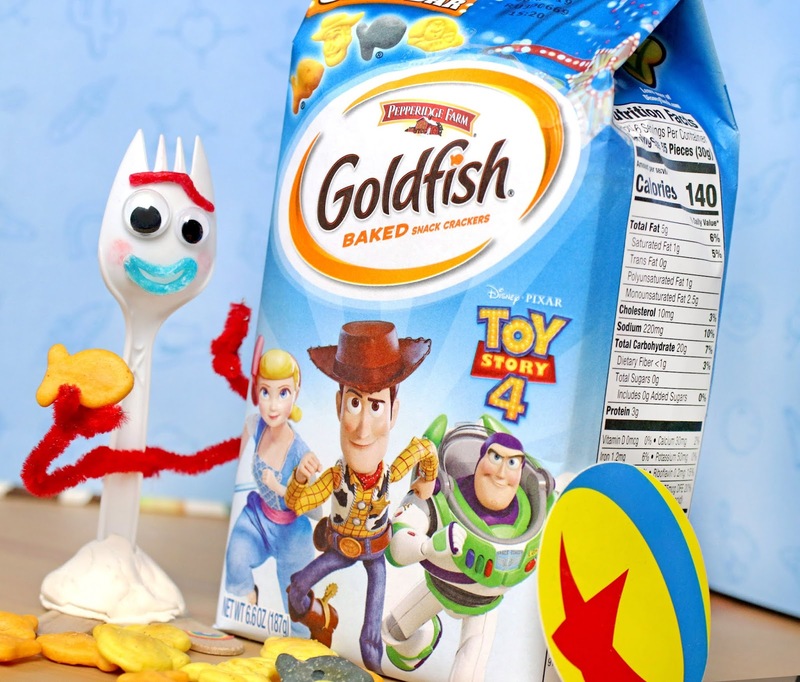 Toy Story 4: Pepperidge Farm Goldfish NOW AVAILABLE! 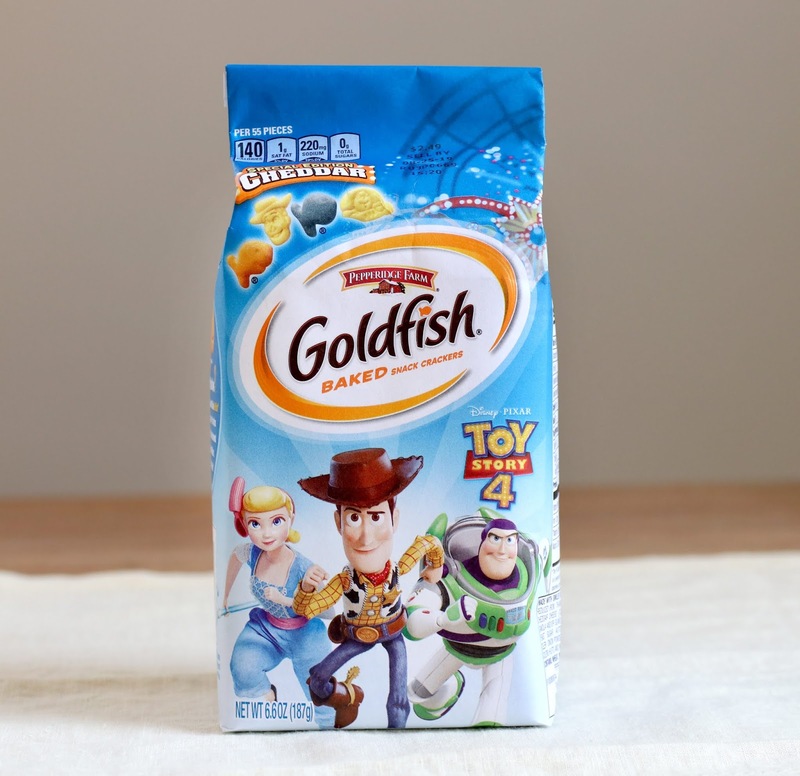 For the fourth year in a row (following Finding Dory, Cars 3 and Incredibles 2), Pepperidge Farm has partnered with Disney·Pixar to bring you some "Special Edition" Cheddar Goldfish—this year inspired by none other than Toy Story 4! 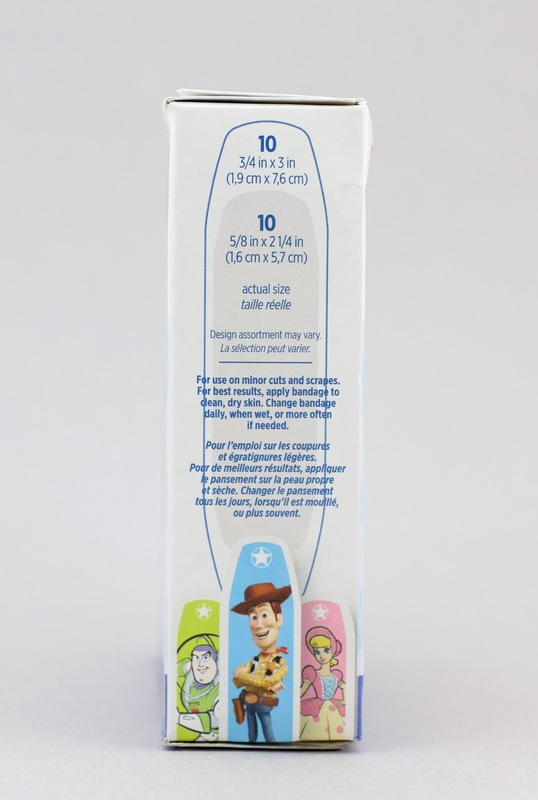 The eye catching packaging celebrates the new film and features Bo Peep, Woody and Buzz in action with some subtle carnival accents in the top corner. 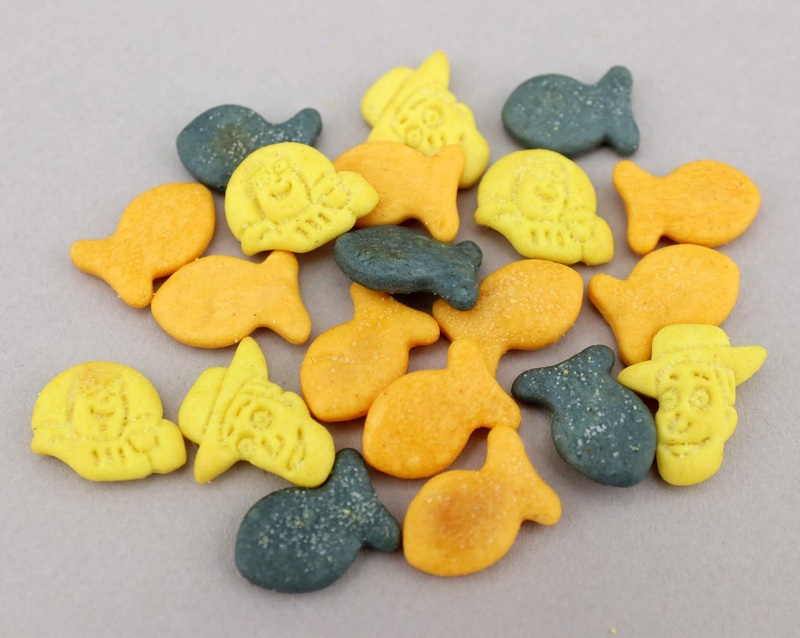 The goldfish themselves are made up of four styles of crackers: traditional orange goldfish (the classic snack that smiles back), blue goldfish and yellow Buzz Lightyear & Woody shaped goldfish; with no artificial colors I might add (only colors sourced by plants). On the back you'll find some other favorite faces (new and old) including Dolly, Trixie, Jessie, Peas in a Pod, Hamm, Alien, Bullseye, Forky, Rex, Bo Peep, Buzz and Woody. 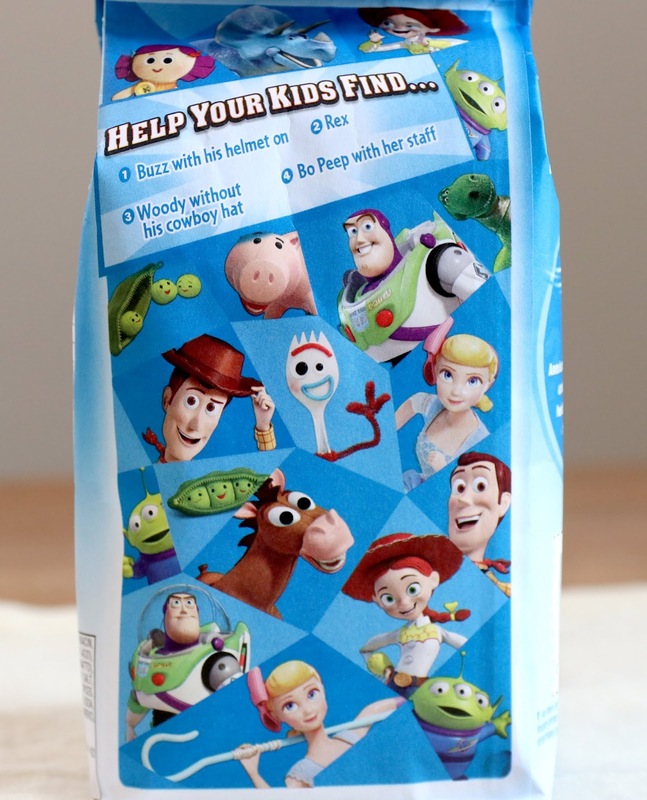 There's also a little "Help Your Kids Find..." game that little ones will certainly enjoy while they're munching. Here are the actual Goldfish out of the bag. Cute and tasty! Prices may vary by location, but I picked these up at my local grocery store (ShopRite) for $2.49. Apparently they should be hitting all major retailers (including Walmart and Target) on May 1st. I'm a big kid at heart (like all Disney fans), so I could not resist these. Goldfish crackers are timeless anyway, really any age can enjoy them right? 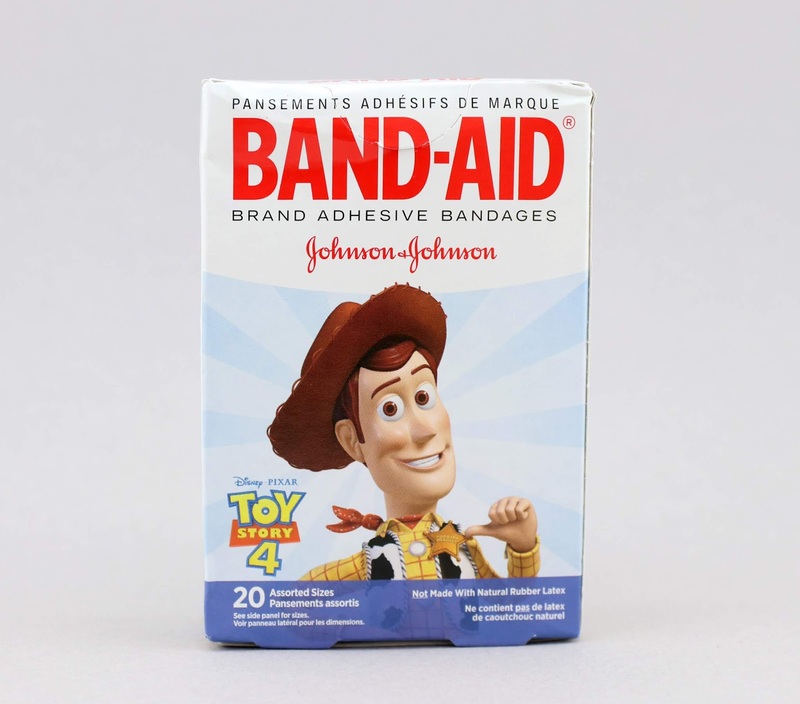 I can't recommend these enough for all you Toy Story fans alike out there. As seen below, even Forky has been enjoying them with me! And come on, he's a spork who can't even eat. Will you be picking these up for your pantry? They'd even make the perfect movie snack for when the film hits theaters on June 21st. Something to keep in mind! Shout out you thoughts down below. Hi everyone! 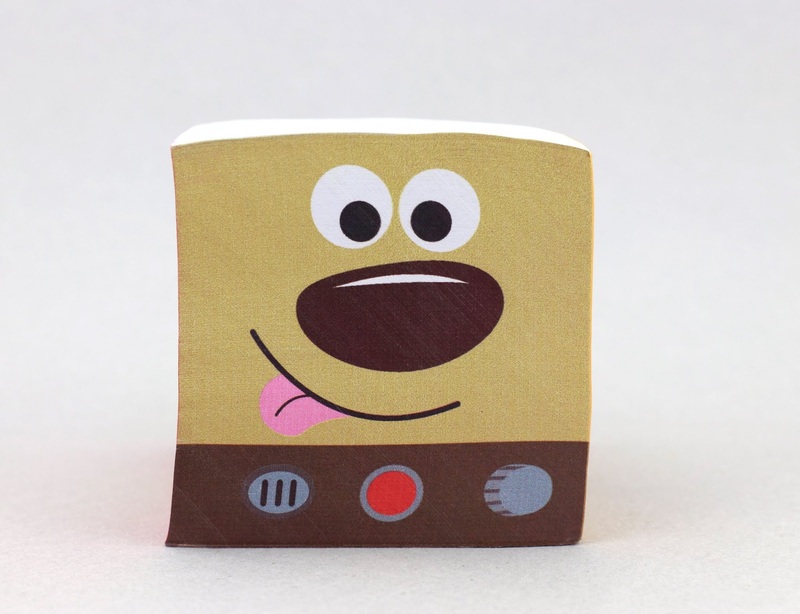 Here's something I've been working on for all you Toy Story fans and collectors out there (myself included). 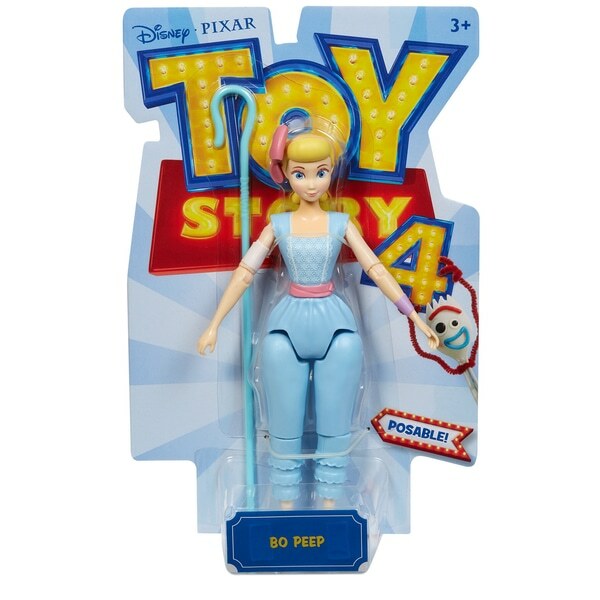 With all the Toy Story 4 merch officially hitting stores this week, you may have already noticed that there are a ton of versions of the new Bo Peep being released—from full scale toys to smaller action figures; some with sounds and some without. 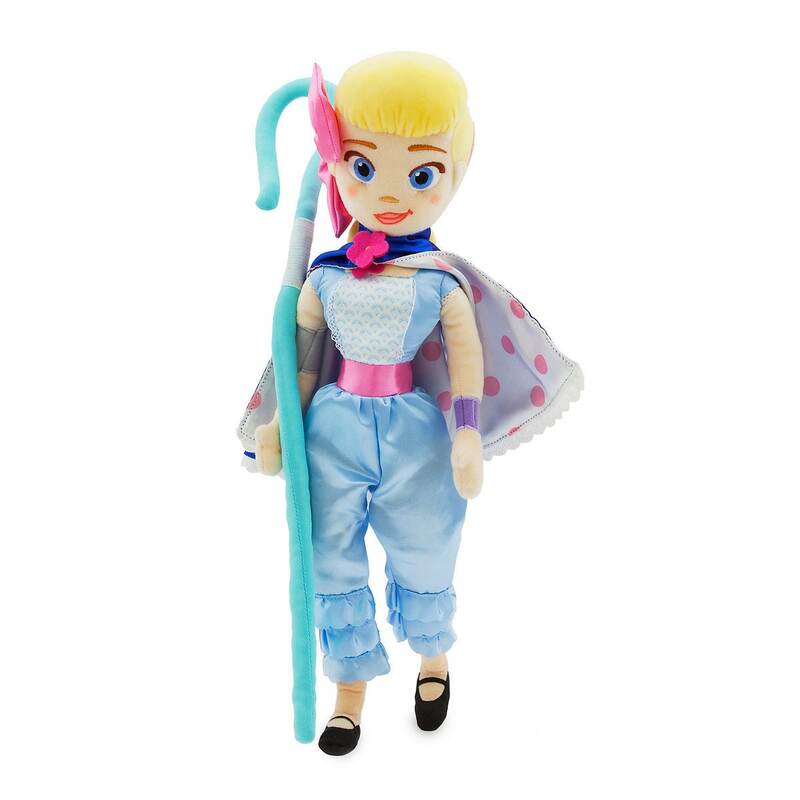 Heck, even a Barbie style Bo with brushable rooted hair. 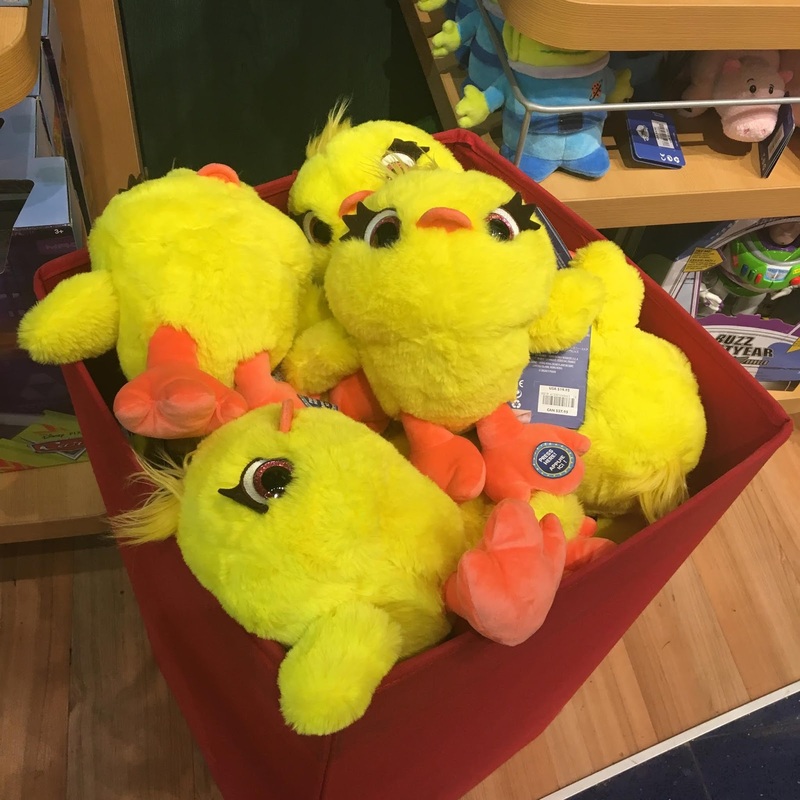 Honestly it can be a bit overwhelming keeping track of them all, so I wanted to make this definitive guide to help you narrow down what you (or your kids) are personally looking for in a Bo Peep toy. I know it's helping me! 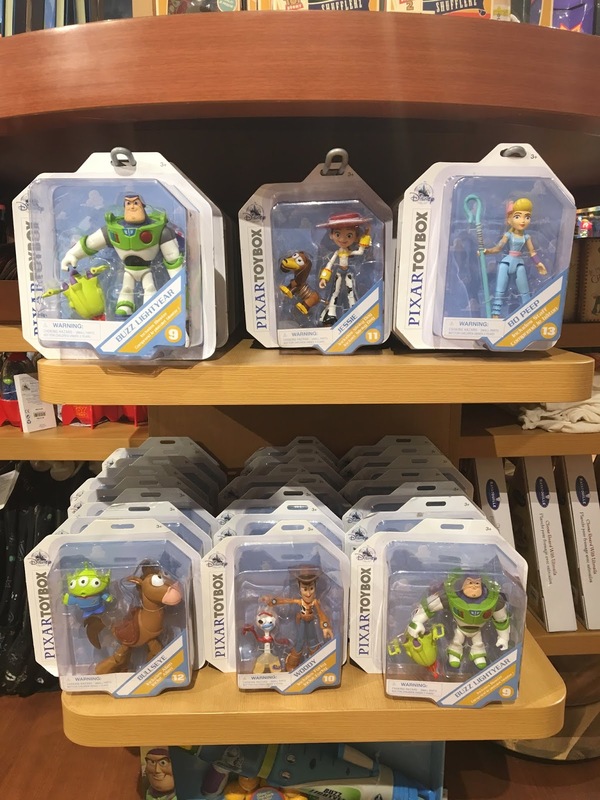 Maybe you're the type of completest collector that will end up buying all of these (if that's your thing, then more power to you). But maybe you're more like me and are just looking for one that's the best, most movie accurate version to add to your collection—and some of the smaller scale figures as well. Whatever type of collector you are and whatever your budget, there's certainly something here for everyone. 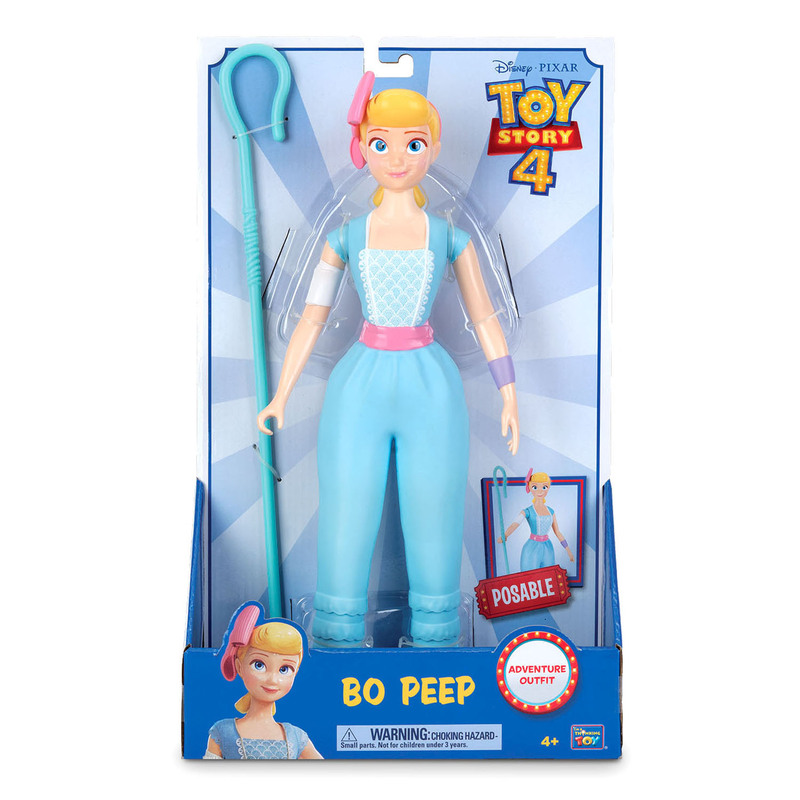 Below you will see all the currently known toys of Bo Peep out there from three companies: Thinkway Toys, Mattel and the Disney Store. 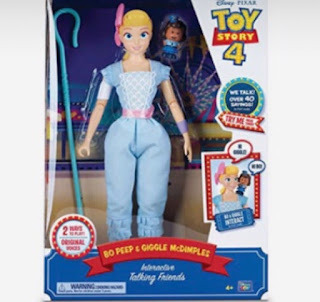 And though I don't have a picture of it yet, it has been confirmed that a Toy Story Signature Collection Bo Peep (with sheep) will also be released! There are no photos or additional info at this time, but I'll add it here as soon as it surfaces. 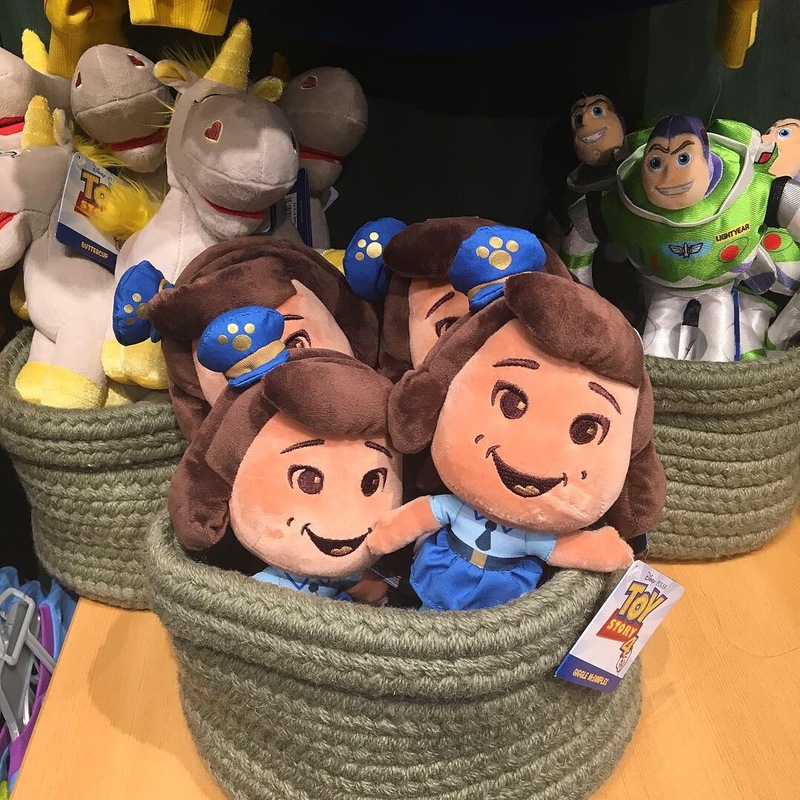 Out of these, I'm leaning towards the Disney Store version or the Thinkway Deluxe Talking Adventure Figure (though it's a bummer those ones don't come with Giggles McDimple). However, even though I haven't seen any photos yet, I'll probably end up going for the Signature Collection one regardless (which will hopefully be the best and have everything, including Giggles). 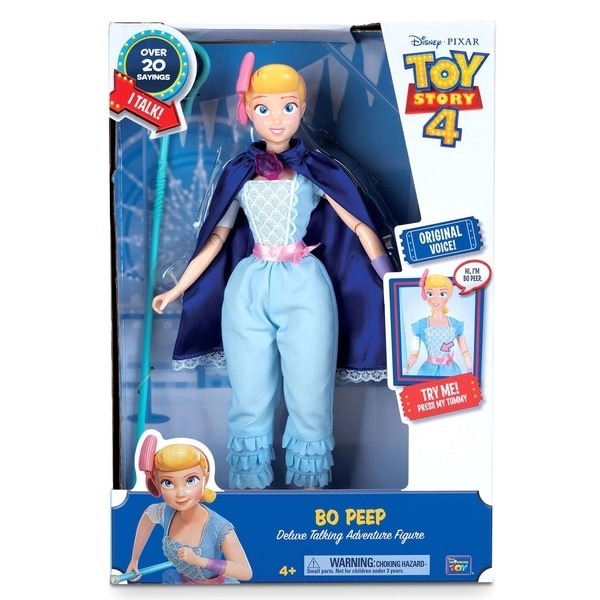 I also plan on collecting the 7" action figure line too, so that Bo Peep will be a must. 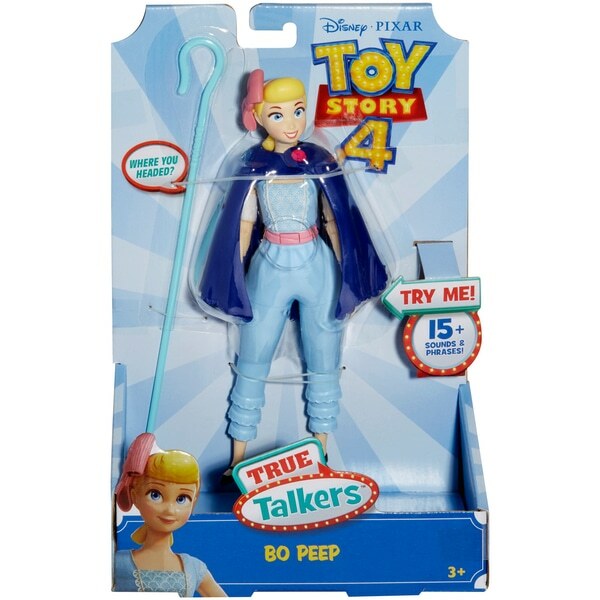 Some other smaller Bo Peep toys to look out for are the Mattel Toy Story "minis" figure, the Imaginext figure, the LEGO minfigure and the Fisher-Price Little People figure. I'll be picking those up as well. 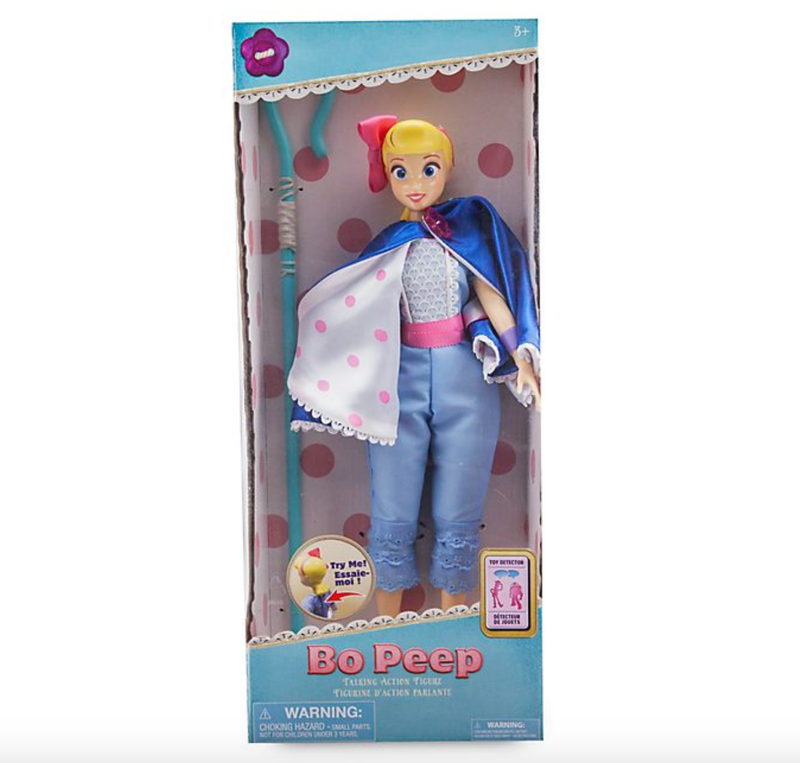 Which version (or versions) of Bo Peep are you planning on purchasing? Which one do you feel is the most screen accurate so far? Which of these toys is your personal favorite? Shout out all your thoughts below! Looking forward to hearing what you have to say. 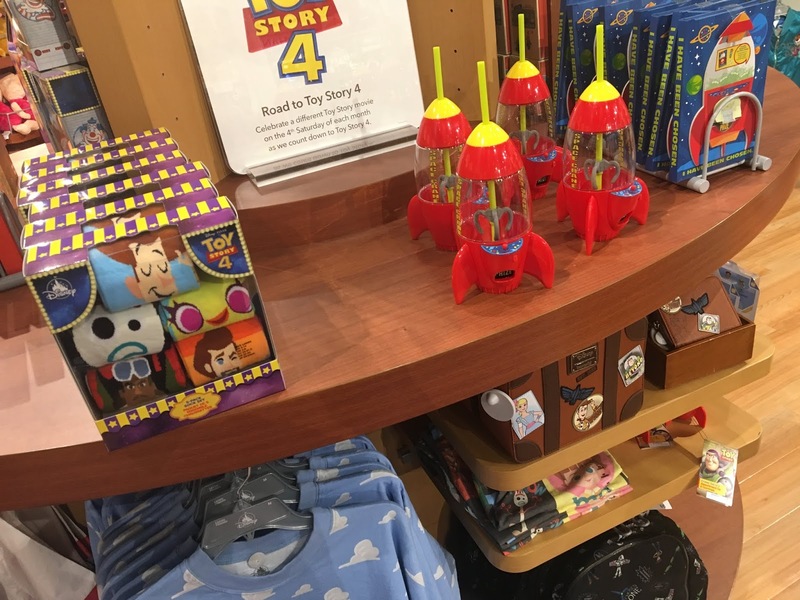 Events: The Disney Store Toy Story 4 Merchandise Release—AVAILABLE NOW! 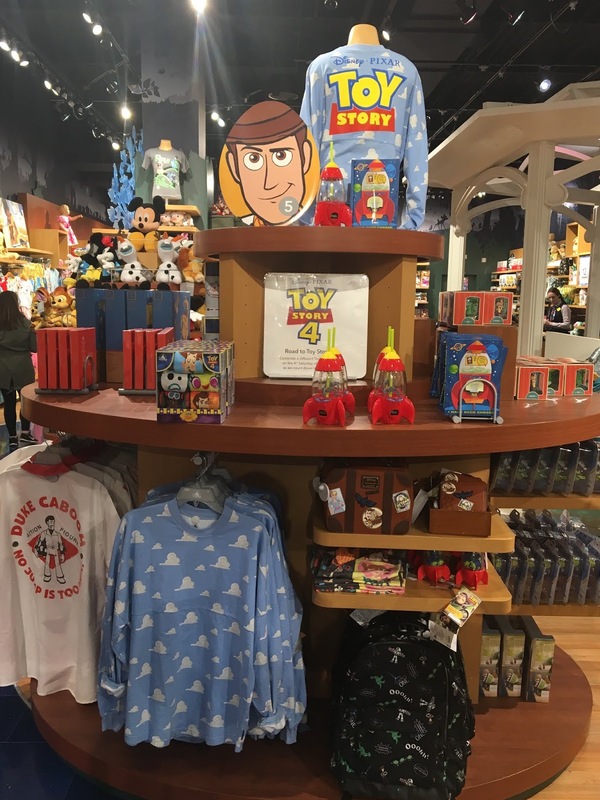 This past Monday (April 15th), the Disney Store launched phase one of their Toy Story 4 collection—online and in-store! 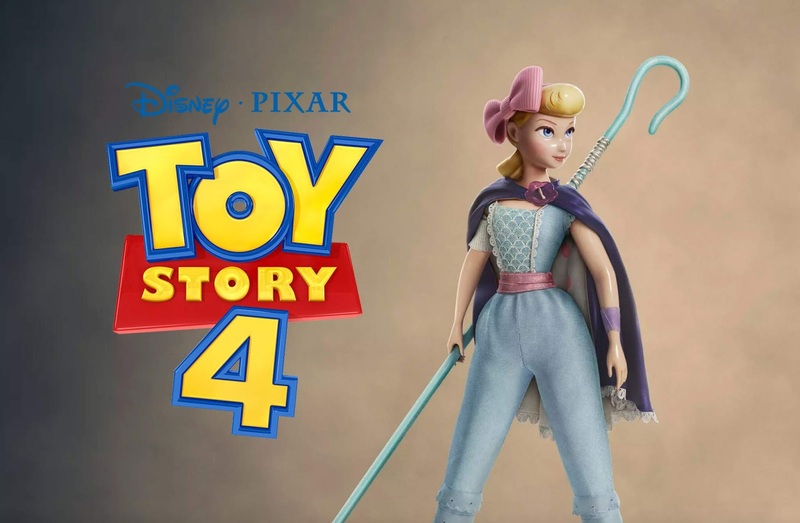 Things are getting real over here folks...Toy Story 4 is upon us and coming faster than you can say "there's a snake in my boot." 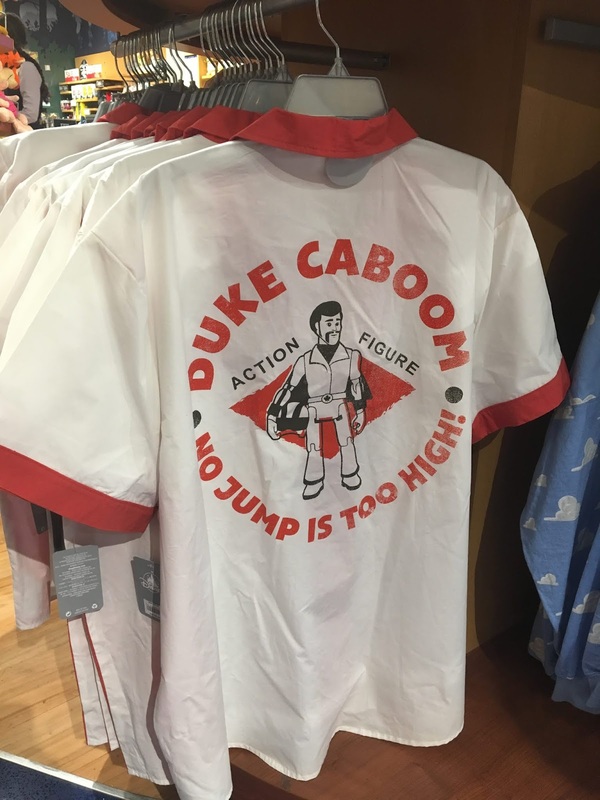 As if it wasn't surreal enough that the film is finally just about here after all the years, the merchandise hits stores. What a glorious sight! 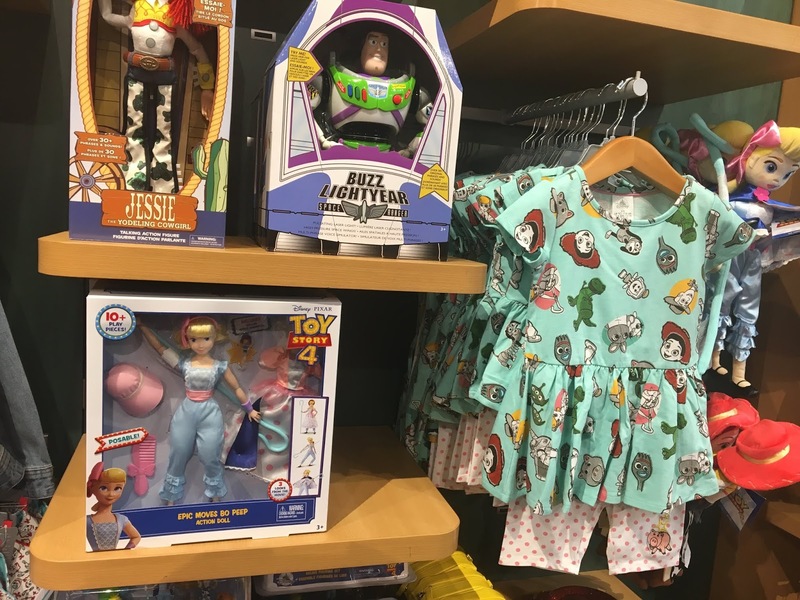 I remember so vividly when Toy Story 3 merch hit stores back in 2010. 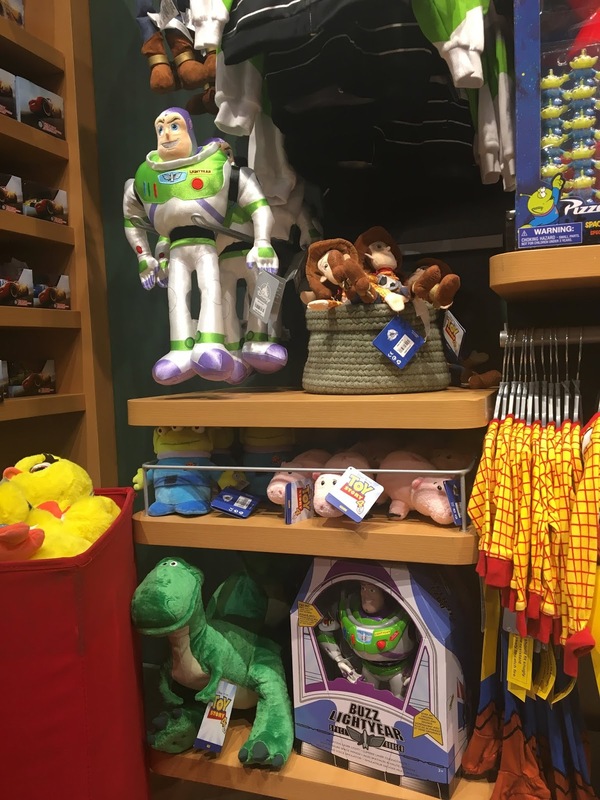 From what we knew at the time, it was the very last Toy Story film—so I went crazy getting all I could (since I figured it would never be like that again). It was my last chance to stock up on anything and everything Toy Story. Boy was I wrong! It's back and bigger than ever. Between all the products you'll be able to find soon at Walmart and Target (April 22nd) and all this (plus more to come), the amount of items seems to be endless. 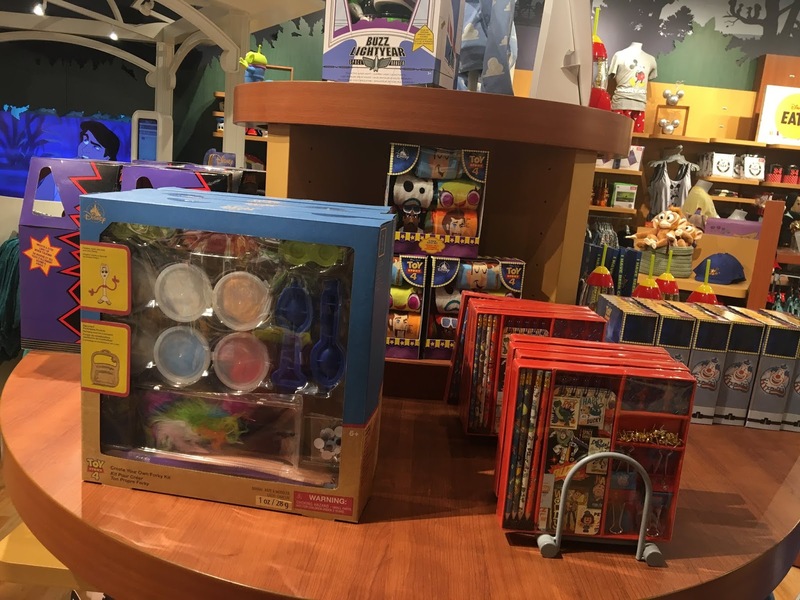 Anyway, I always love documenting the Disney Store in-store setups here on my blog and giving you a peek at what's available whenever new Pixar merch hits...this time would be no different! 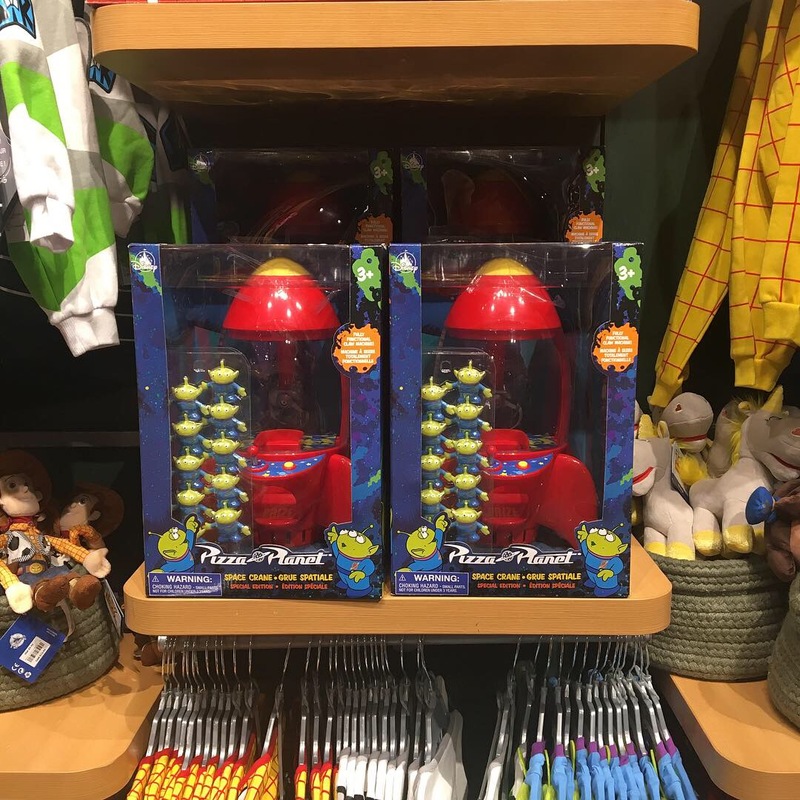 This tradition began years ago when I was searching online for pictures of older Disney Store merchandise/displays from some of my favorite Disney and Pixar films. I wanted to reminisce, but couldn't find anything...so I began doing this for myself and for anyone down the road who may come across this post. So far since I started this blog, I've done this for Monsters University, Inside Out, The Good Dinosaur, Finding Dory, Cars 3, Coco and Incredibles 2. It's a bit of history! Maybe you're coming across this post years from now looking to take a trip down memory lane like I had been trying to do. Who knows? 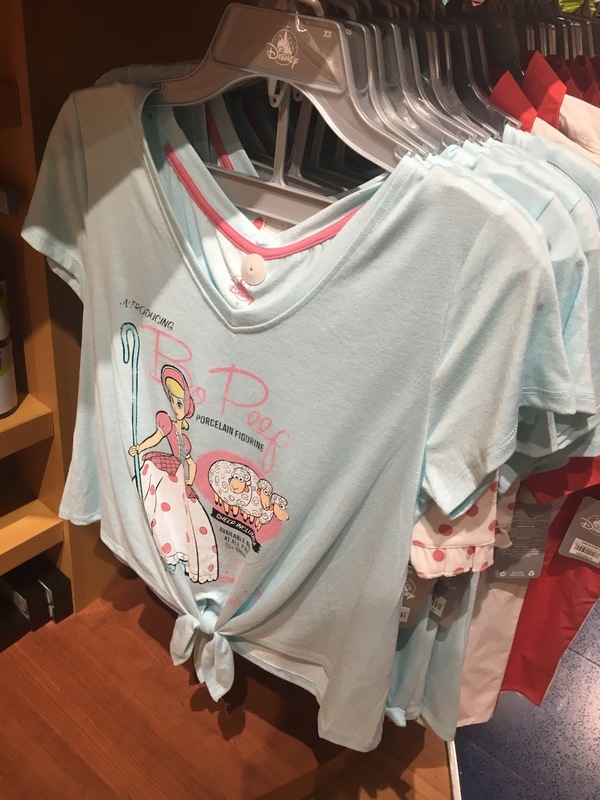 If you've seen what's on ShopDisney already, then you've seen all this. In fact, the website has even more than what you see above and below. 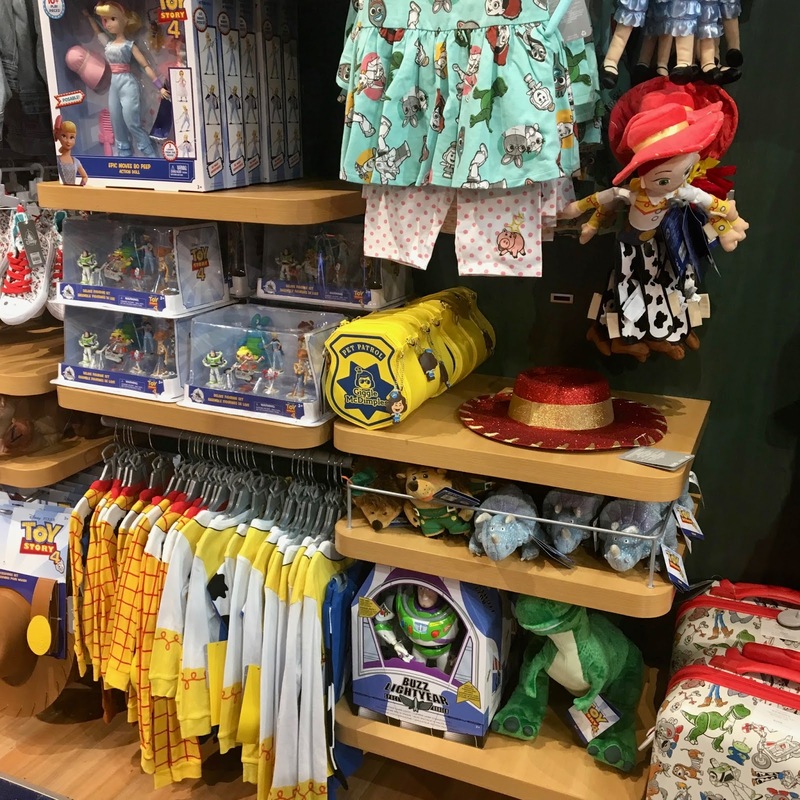 However, it's one thing seeing all this stuff individually on the website; it's another to see it all displayed together in a giant themed section of the store. Totally magical! Let's get to checking it all out a bit closer. 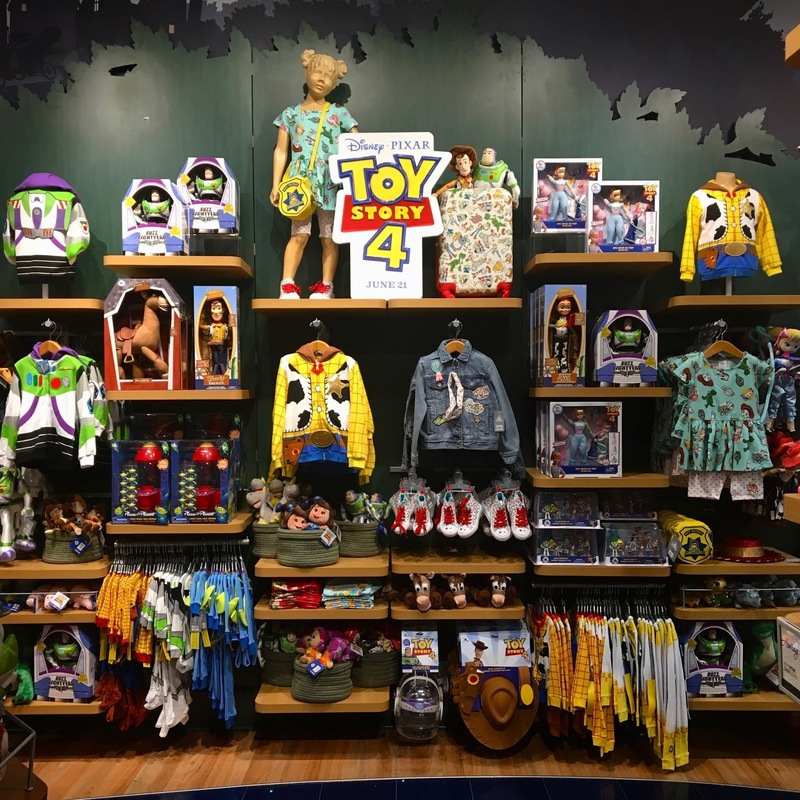 I won't be buying a ton of this (there aren't many "must haves" for me here and a lot of it is apparel for kids, re-releases or items geared towards women/girls), but certainly expect full reviews soon of some of my fave items (like the working Toy Story crane game and possibly some of the plush). 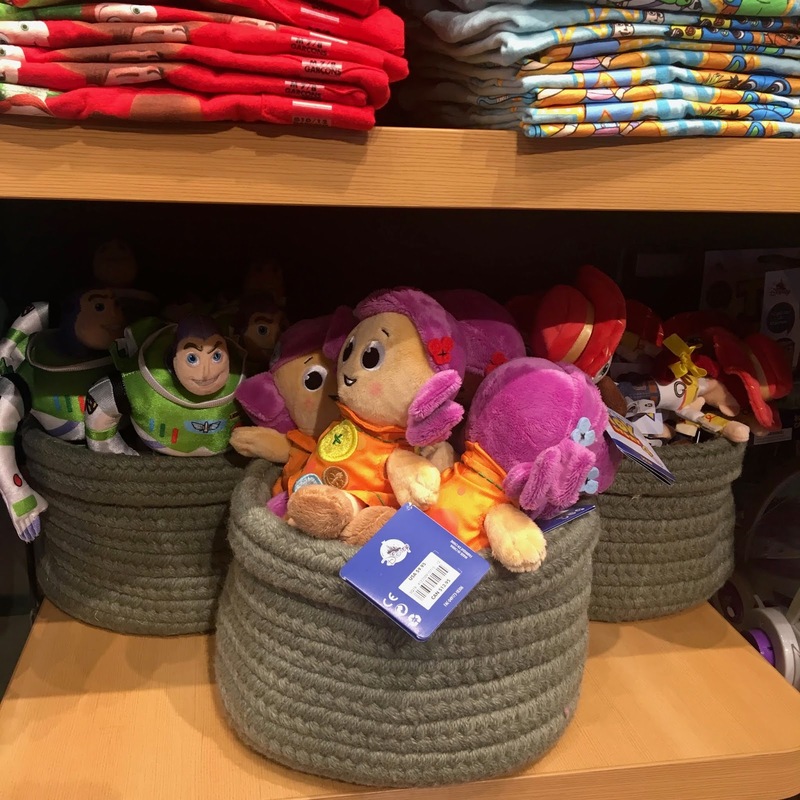 Speaking of the plush, one main item you'll notice missing here is the plush Forky. Can you believe he had already sold out by the time I visited last night? That's right, in one day he was gone. 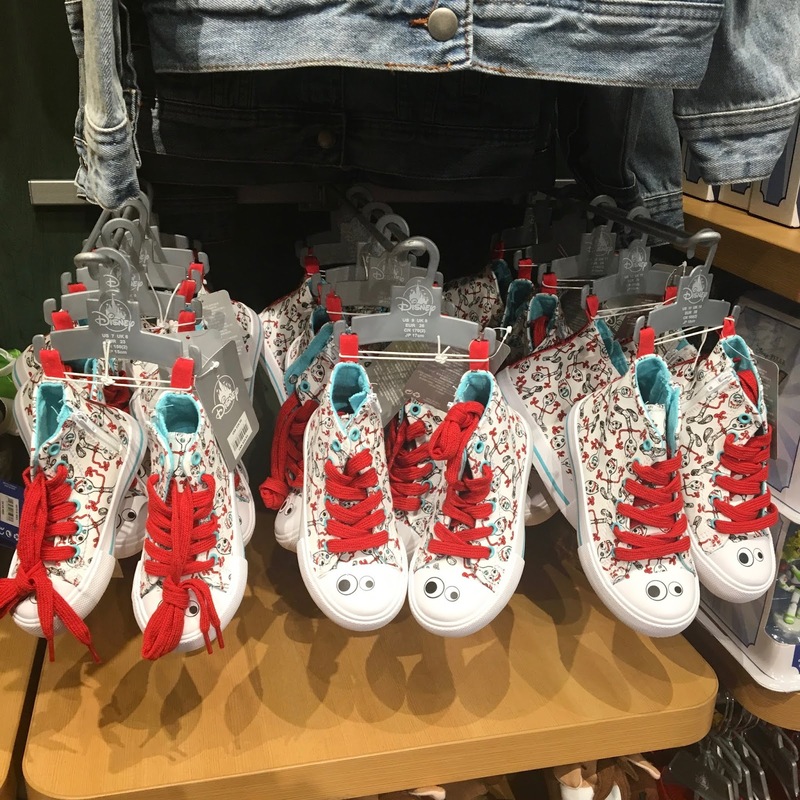 Even though I won't be getting these since they're for kids, I found these Forky shoes hilarious and fun! These are gonna be a huge hit if the character turns out to be a fan fave. 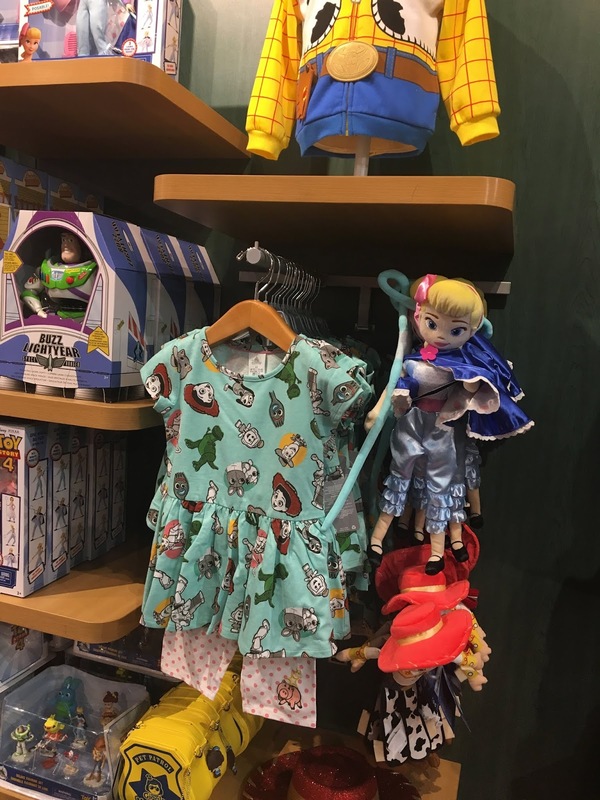 And on this fixture, you'll notice some of the older "Road to Toy Story 4" items that have been released over the past couple months. They're kind of mixed in with the new stuff. So what are your thoughts!? 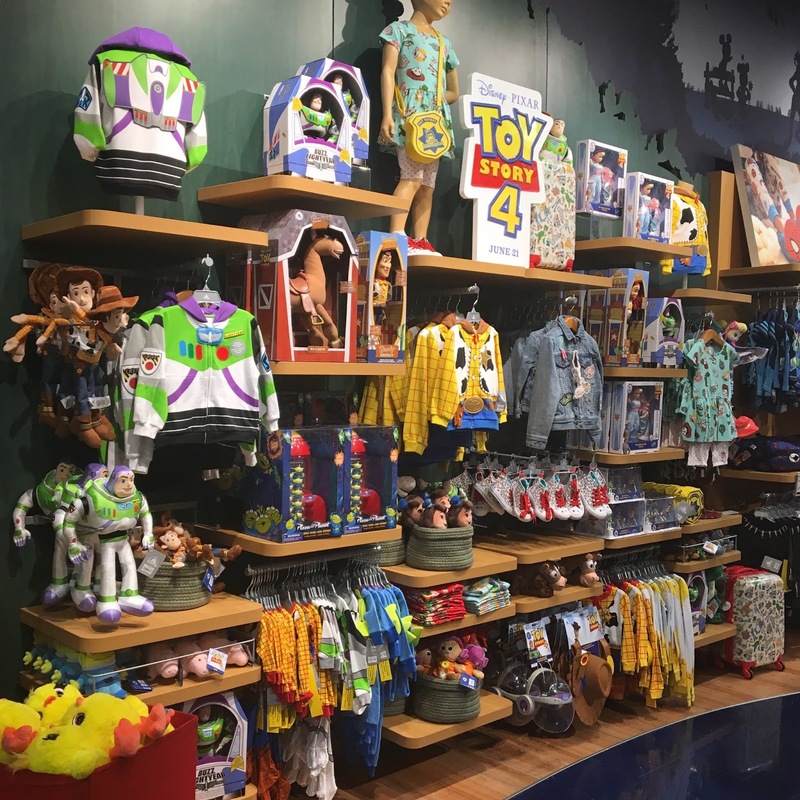 Have you gone to your Disney Store yet to check all this out (or maybe already placed an order online)? What are your "must have" items or favorites in general? Looking forward to hearing what you have to say down below! Yee-Haw! 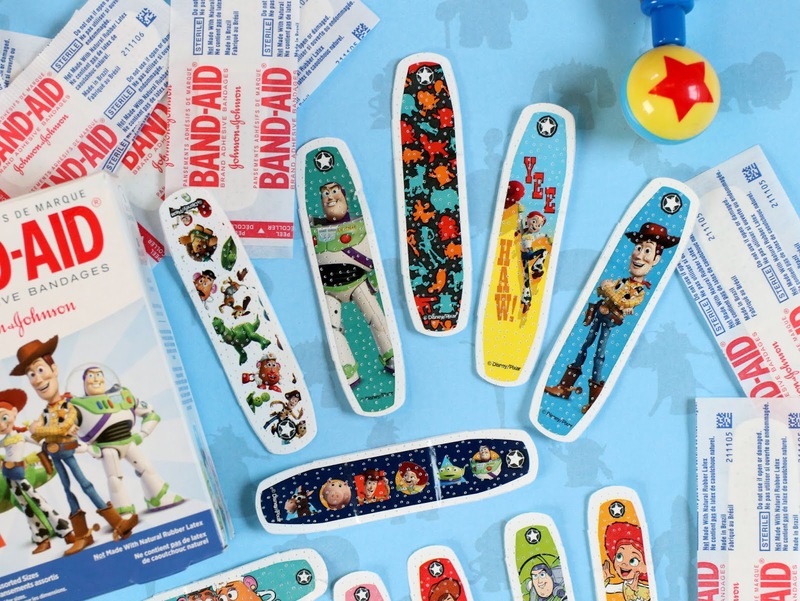 I've collected Pixar Band-Aids for years (my kids someday are gonna have quite the stash, probably enough to cover their whole childhood)—essentially all the Band-Aid packs from Toy Story 3 through now. 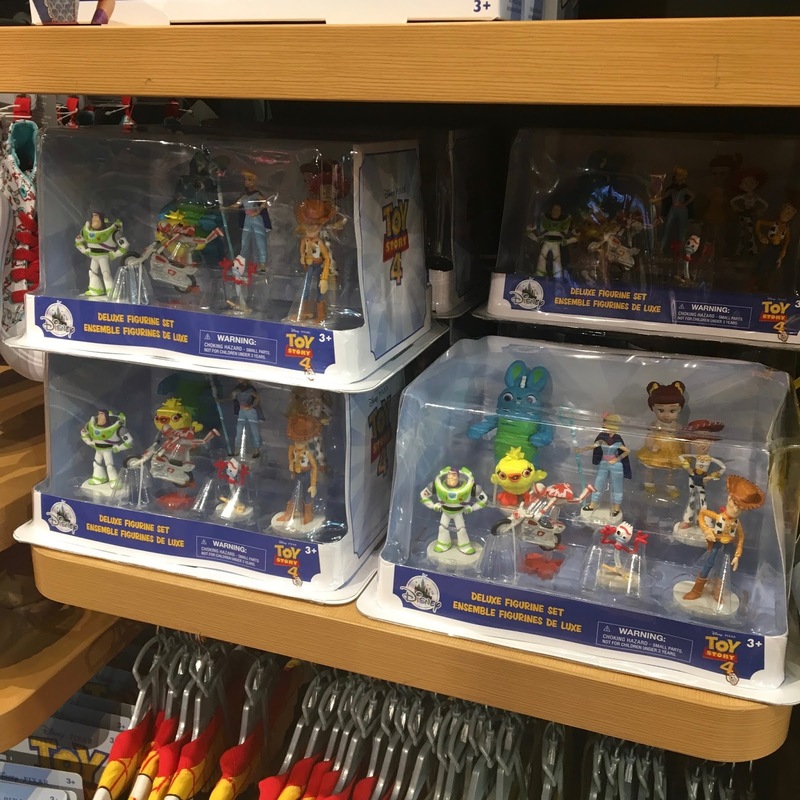 Of course I've been checking Target often since I knew these Toy Story 4 ones would be coming, and I finally just found them! 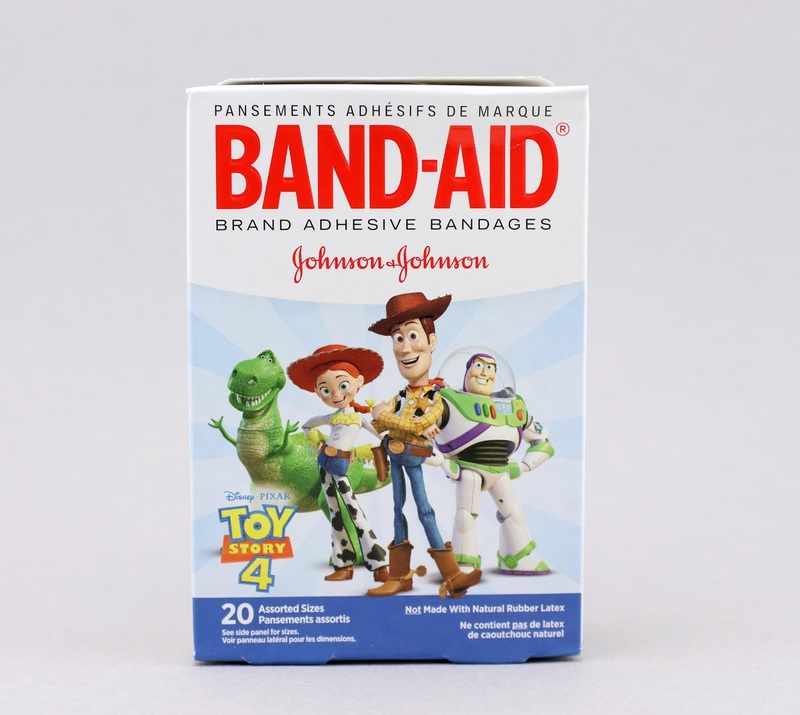 The box is cute and the Band-Aid art is adorably stylized; however even though this is branded Toy Story 4, there's no Toy Story 4 specific characters or anything related to the new film in the slightest. 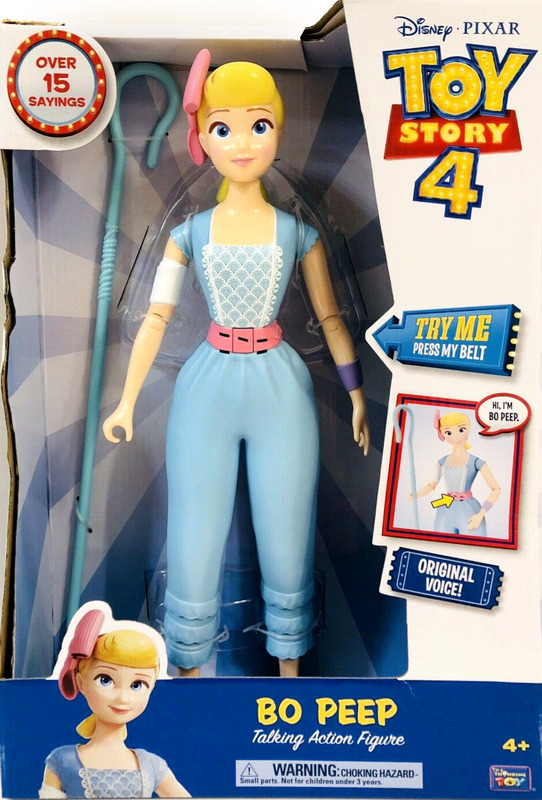 Even the Bo Peep art is the original design and all the rendered versions of the characters (both on the box and Band-Aids themselves) definitely seem to be old character models. 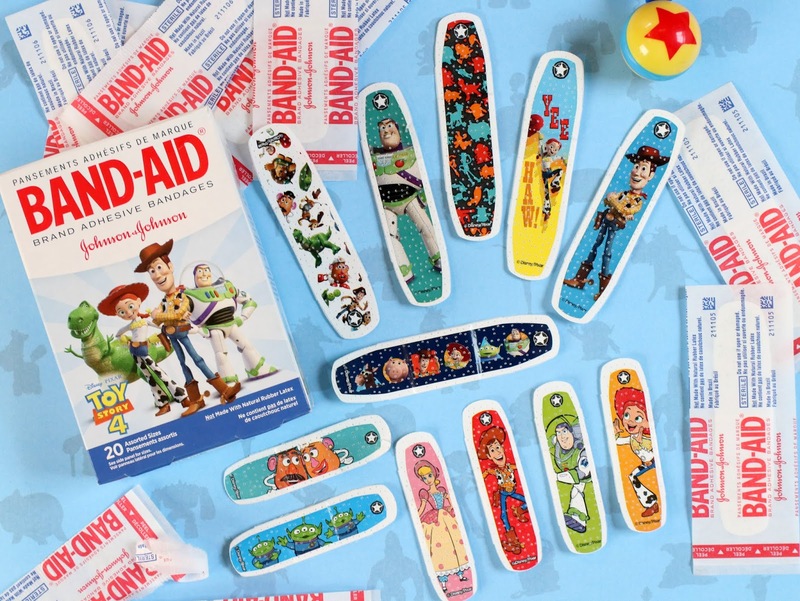 Either way though, the Band-Aid designs are colorful and well done featuring all our favorite classic characters. 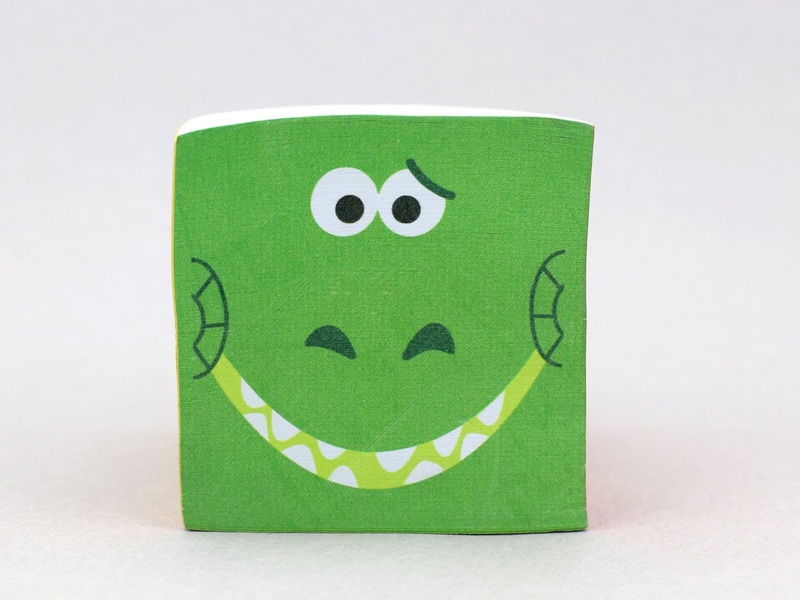 It honestly seems like just yesterday I was picking up the Band-Aids for Toy Story 3—how has it been 9 years?! 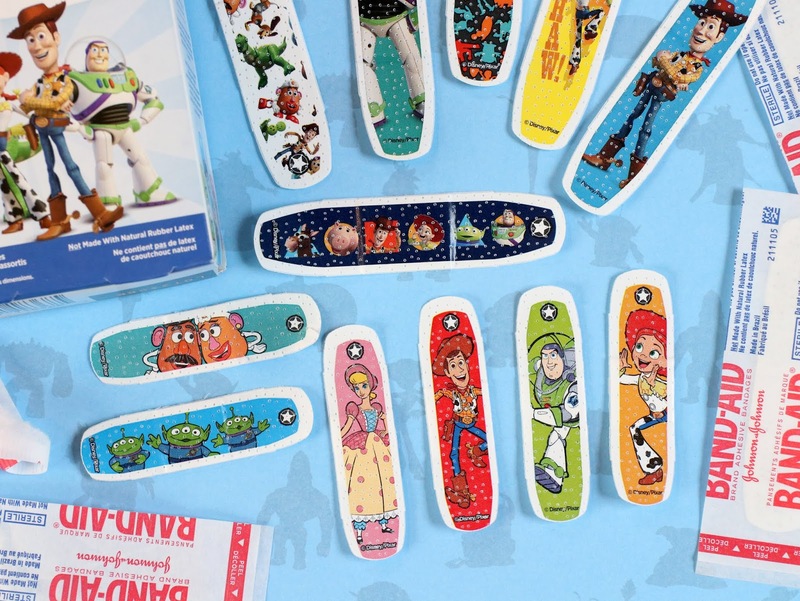 Inside the box you'll find 20 bandages (assorted sizes—10 large, 10 small) with 12 unique designs. See them all below! Be sure to visit your local store soon (Target or Walmart are your best bets) if you're interested in adding these to your home's first aid box. Retail price at Target is $3.29. 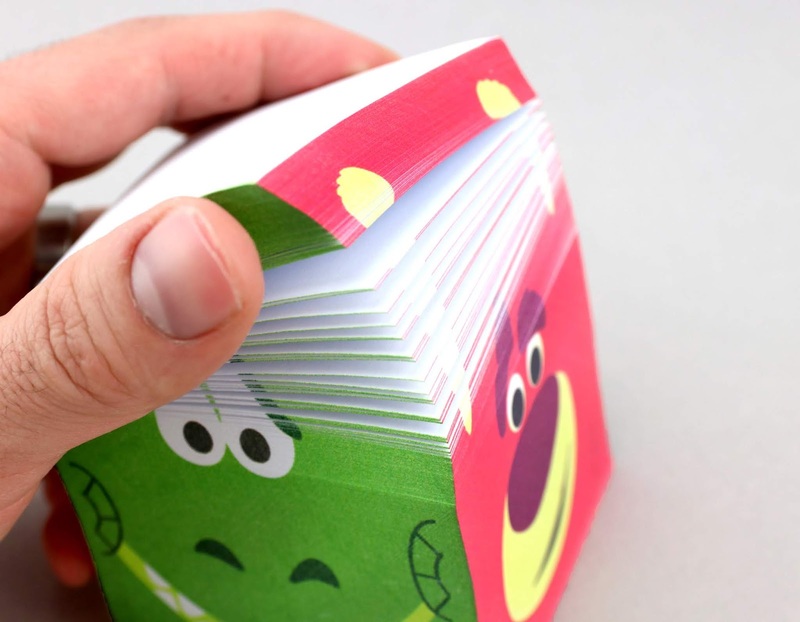 If your little ones are already fans of Toy Story, then these might be a must have! If you're an adult and you're interested in these for yourself, no shame. I encourage that. Let me know your thoughts in the comments below! Will you be picking these up? What's your favorite design? I love the minimal one with the blue, orange and red character silhouettes probably the best. 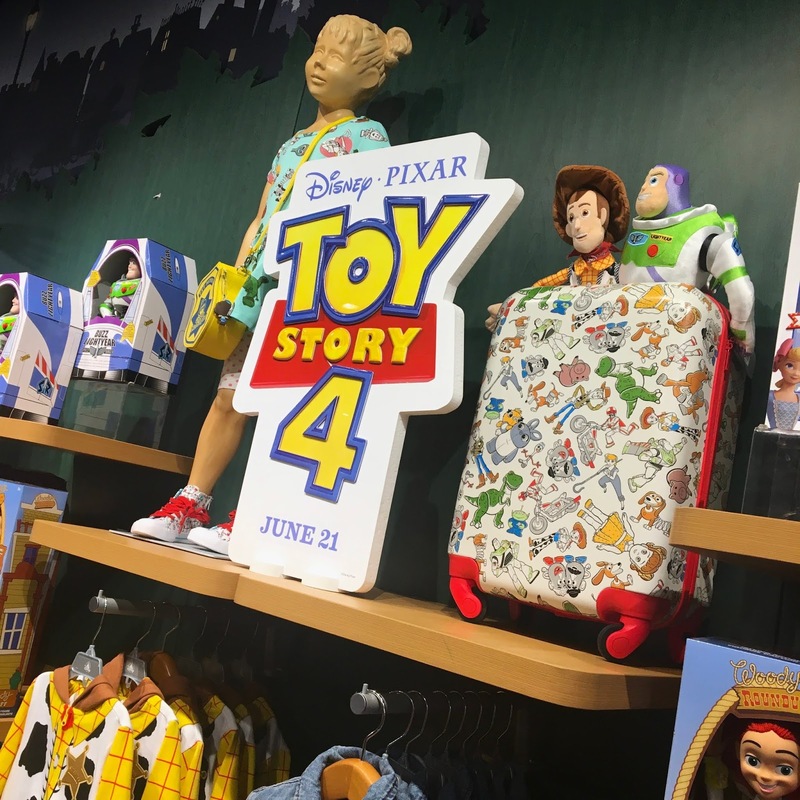 Stay tuned for much more from Toy Story 4 right here soon!